What Is Ninite and How Do You Use It? Ninite is an easy-to-use online service that allows users to install multiple software programs on to a computer all at once. It does this by using a program you download first and managing the apps from that, rather than doing it all yourself. The app installer is a quick and easy way to download bulk applications reliably and securely. Ninite only works on a Windows machine. Most of us have installed different forms of software on our computers, from voice and video call solutions like Skype or WhatsApp to antivirus and security programs. Then there are internet browsers, such as Chrome or Firefox. In general, we install individual programs one by one and whilst the set up for each program isn’t complicated, it is a time-consuming exercise. Enter Ninite: a tool that has been designed specifically to install multiple programs simultaneously. Applications are installed from their respective official websites, ensuring the latest official versions are always downloaded. Any adware that is optional on downloading is ignored and blocked by Ninite, using the option to deselect the adware or suspicious extensions during the installation process. Ninite also applies any software updates in a timely and efficient manner; no more updating installed programs one at a time. Not everyone program is available to install via Ninite, but it's worth checking out to see if it meets your needs. Using the Ninite tool, select the applications you want to install on your system and Ninite will download one installation package that incorporates all the chosen applications. Ninite is simple to use in a few easy steps. Go to the Ninite website: http://ninite.com. Select all the applications you want to install. Click Get your Ninite to download a customized installer. Once downloaded, choose the relevant applications, run the installer and leave the rest to Ninite. Automatically installs the applications/programs using default settings at default locations. Ignores and deselects any adware ensuring that it isn’t installed with the application. Automatically detects 64-bit or 32-bit systems and installs the relevant program. Applications are automatically installed in the computer’s language. The latest version is always downloaded from their official websites together with any updates. Existing installed applications are ignored unless they need updating, and all reboot requests are actioned. 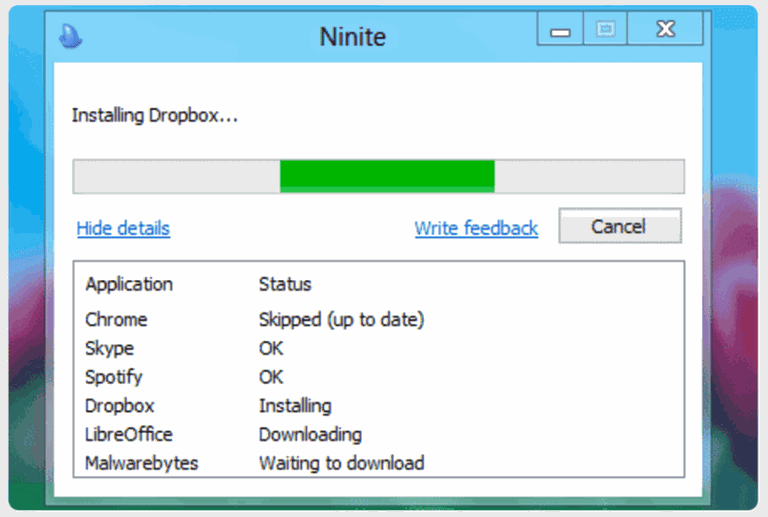 Easy to use and runs the installation process when Ninite is downloaded. Every Ninite installation is stamped with an installer ID which is used to ensure that only the latest version of the application is installed. In Ninite Pro, it is possible to lock the installed version of the application using a freeze switch. The Pro version also has a download cache that skips the download step and completes the installation process more quickly. The list of applications that can be downloaded and installed by Ninite is comprehensive and free to use. The applications are grouped under specific headings – Messaging, Media, Developer Tools, Imaging, Security and more. On the Ninite website is a list of the apps that can be installed, for example, Chrome, Skype, iTunes, PDFCreator, Foxit Reader, Dropbox, OneDrive, Spotify, AVG, SUPERAntiSpyware, Avast, Evernote, Google Earth, Eclipse, TeamViewer, and FireZilla. Currently, Ninite and Ninite Pro list 119 programs that can be installed. If the app you want to install is not listed by Ninite, it is possible to send a request for a particular application to be added via their suggestion form. Once your applications are installed and ensuring internet connection, Ninite can be set to automatically update your installed applications at regular intervals, making sure that your system’s applications are always the latest available version without you having to make any effort at all. The apps updates and patches can be controlled manually, set automatically, ‘locked’ in Ninite Pro so that the current version won’t be changed, or updated manually. If an installed app needs repairing, Ninite allows the reinstallation of the app via the retry/reinstall link. Your software apps can be managed via a live web interface. Apps can be individually selected for update, installation or uninstall either as a bulk action or one by one. The instruction can be sent to offline machines via the web interface which will be actioned once the machine is online. However, Ninite isn’t able to update apps that are running. Apps that need updating need to be closed manually before the update can be activated. What Is the System Recovery Options Menu? What Is the Command Prompt in Windows, and How Do I Open It? What Can You Do With Xbox SmartGlass? How Do You See What a Website Used to Look Like?